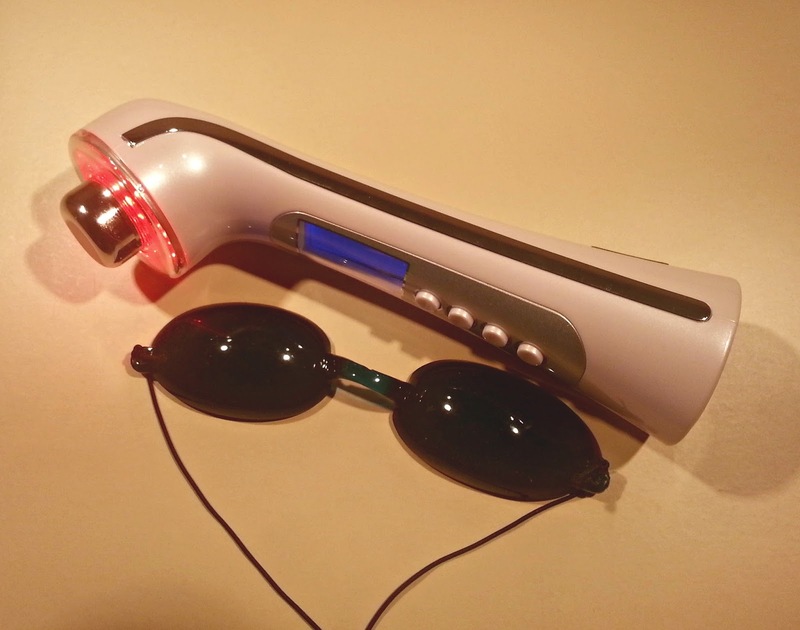 During the run-up to Christmas, I received a TrulyClear 2 Light Therapy System to play with and I mentioned it in a couple of our gift guides, as I really felt it had a lot to offer as a multi-functional beauty product. After the initial first impression, I promised I would give it a proper try and report on the progress and how I got on with it, as it would take a while to see if it worked. I've been testing it over the last few weeks and thought it was time to let you know how it went. 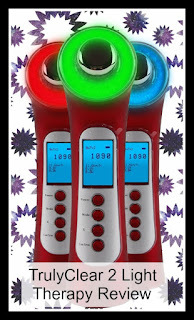 The TrulyClear 2 Light Therapy System is available from US company True Company and retails at £329. This is a review based on my own personal experience, all opinions are my own. Firstly, a little background. Light therapy is used to treat various skin conditions and has been available in salons for some time, with treatments starting at around £49 for one treatment. A home solution could prove much more cost effective, as well as being far more convenient. The TrulyClear 2 does not promise to treat medical conditions, and should not be used for this purpose, but it does promise to help with common skin complaints. The lights work as follows; the red light is good for anti-aging, the blue light treats acne, by purifying the skin with its antibacterial properties and the green light helps with skin discolouration. 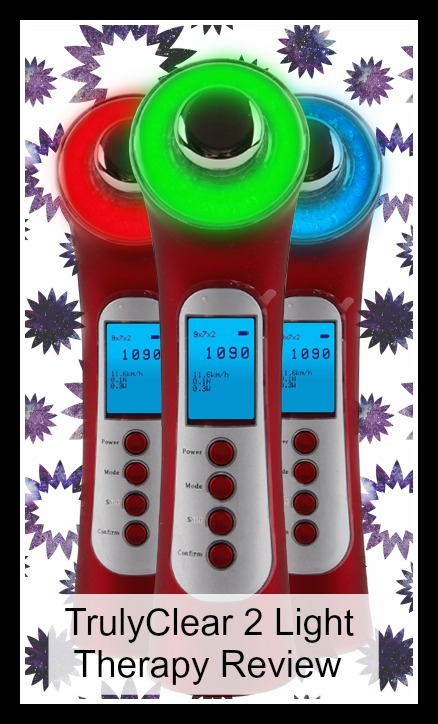 What's great about the TrulyClear 2 is that it doesn't just offer one light therapy colour, it offers all three, giving maximum flexibility for those with combination skin and making it much better value for money. Skin changes over time, and, whilst you might need one colour therapy now, there's a chance that might change with age and this product can grow with you and attend to your skin care needs a long time into the future. The device is very easy to operate. I was initially concerned about the very small instruction manual, but there really isn't a lot to learn. I love that it is very simple to operate, because I've been put off using similar products before, at the risk of doing something wrong, but I felt quite confident with this one. Even a bear with very little brain (ahem) would be able to work it out. The goggles are reassuring too, because the light is VERY bright and it isn't wise to have it near your eyes. programming it takes a bit of getting used to, because you have to try to do it without looking into the light, but I got the hang of it. The only downside of the goggles is that it means you can't really do anything else whilst you are using the device, like watch TV or read a book, but they are a necessary safety feature, so it pays to be patient. It's actually incredibly relaxing, anyway, so it's quite nice to be able to give the experience your full attention. So, the big question is, did it make a difference? The answer is a resounding yes. I didn't realise how much of a difference it had made until I stopped using it, and I coud see my skin was starting to look tired and older than it had been. I don't know if using it for longer would make the results last longer, but I have found that a few minutes every other evening is enough to keep my skin looking plump and refreshed, which I don't think is much of a sacrifice. I will certainly be carrying on using it, it's so quick and straightforward, it's proven to be an easy win for my skincare routine. Hi. Do you have your own before and after photos? I don't at the moment, but I've had to stop using it again, because the charger isn't working and I can already see my skin looking worse. When I can get a new charger, I'm planning to take some and do a new updated post about it!